Celebrate love while having fun. Explore Galveston with your favorite and #1 sightseeing tour agency. Most of the couples adore our romantic sunset tour, where they observe the beautiful sunset from the port of Galveston. Other couples are way-too-chill and would prefer the rat-pack tour and experience Frank Sinatra and Al Capone’s lifestyle. See where Frank Sinatra, Sammy Davis Junior and Al Capone lived, performed and made history. Additionally, some like to increase their knowledge together. The Magical History tour is perfect for them. Artistic couples, however, would prefer the tree carvings tour. Group photo of our clients, alongside our tour guide on the Tree Carvings tour. Some couples are living on the edge and adore the perilous lifestyle. The scary Haunted Legends Ghost tour is perfect for them. Which one are you? If you’re none of the above, let’s remind you that we have our private tours. You can customize the tour to your interest and taste. On this Sunset Tour, our experienced tour guides will take you through the Silk Stocking Neighborhood. You will get an opportunity to hear about important houses such as the Dowry House. 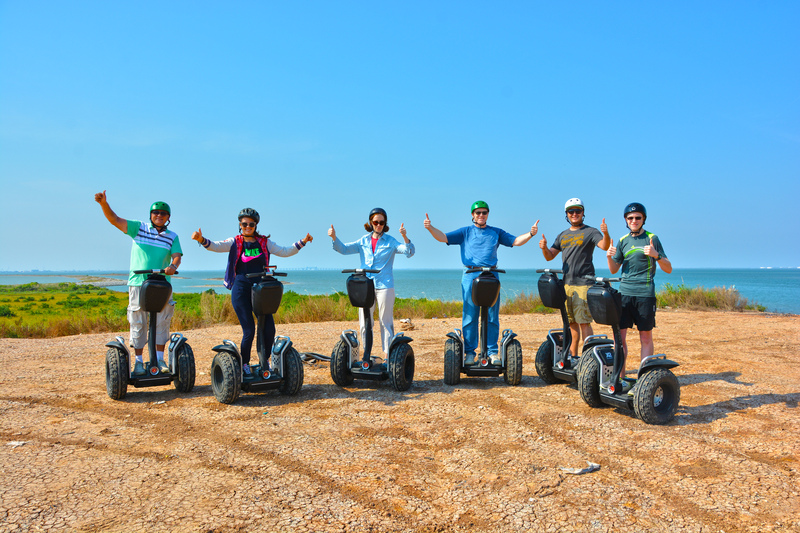 Our Segway will cruise along the Seawall by the historic Pleasure Pier and you will also have the chance to visit the large Murdoch’s Souvenir Shop which originated in 1910. The tour briefly visits the Historical District. It’s where Gresham’s Castle is located, currently known as the Bishops Palace. A breathtaking sunset is observed at the Port of Galveston where the tour concludes. At this moment, the guide will show you the much loved Elissa sailing vessel, the official Tall Ship of Texas. Some other interesting things to treat your eyes with entail are the magnificent Royal Caribbean and Carnival cruise ships. Also, you might see the dolphins, which are feasible from the surface of the waters. Caption on the tour end’s breathtaking sunset. Most amazing will be the sunsets over the water. Besides, you will have the chance to keep great memories by taking photographs of these nice sceneries. The Haunted Legends tour is an interesting adventure. It involves passing by cemeteries where there are haunted houses. These are the houses where paranormal activities have been documented. The stories revolving about the mass murder of the population and dark rumors of misery. Do not be scared to see mysterious lights appear on the haunted houses or when you hear the ghosts or hear their screams. You can enjoy this supernatural images by capturing them with a camera. How did it come to this? Native people believed that ghosts remain with the living when they experience sudden death. Galveston’s has experienced real tragedies throughout time. There were massive disasters, fires, epidemics and desperate slave population. However, the largest disaster in the country remains the sudden death of over 10,000 citizens. They were swept by the hurricane during the evening. The haunted legends tour is frightening and spooky and, therefore, not for the faint-hearted. Hence, visitors are encouraged to bring their garlic neckless to reward the ghosts so that you won’t take one home as a souvenir.